HP's Spectre x360 gets a major upgrade that makes it not only the best convertible laptop, but possibly the best ultrabook laptop, period. Computer makers, much like Hollywood film makers, love sequels. But just as with movies, there’s always a risk with sequels. Will it be a franchise-killing dud like Ghostbusters II or a modern masterpiece like The Godfather Part II? The good news, folks, is that the next-gen HP Spectre x360 13 leans toward the latter, and is arguably even superior to the original. That’s not to say the original Spectre wasn’t a great convertible laptop (convertible, in that its screen folds all the way back to simulate a tablet experience). In fact, it was one of our favorites when introduced. But it wasn’t quite perfect. 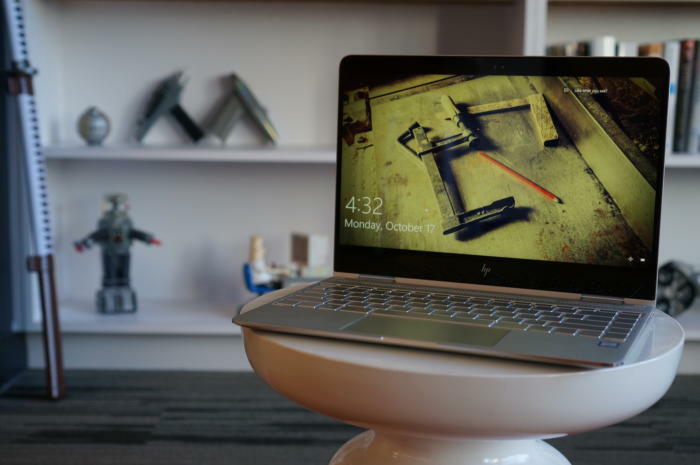 With the reimagined Spectre x360, HP seems to have gone about correcting everything that irked users in the first go-round. 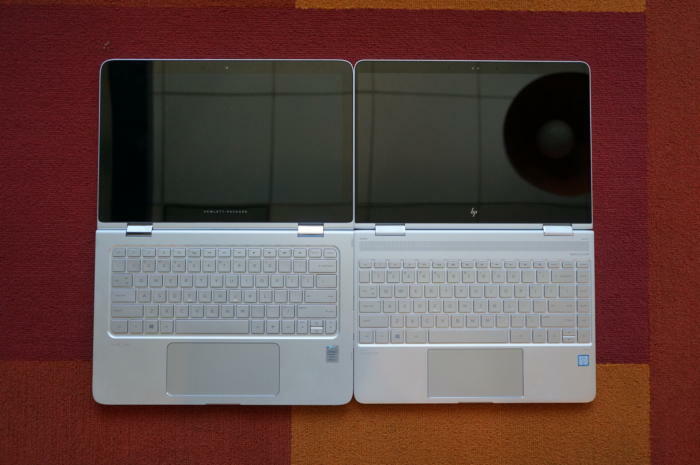 The original HP Spectre x360 13 on the left, and the latest version on the right. The most notable update to the Spectre x360 13 is its size. The original x360 remains one of the widest 13-inch laptops we’ve seen with an aluminum body about 12.75-inches across. That’s maybe a quarter-inch wider than the ridiculously wide MacBook Air 13. And the first x360’s CNC aluminum body wasn’t light either at 3 pounds, 4.5 ounces. 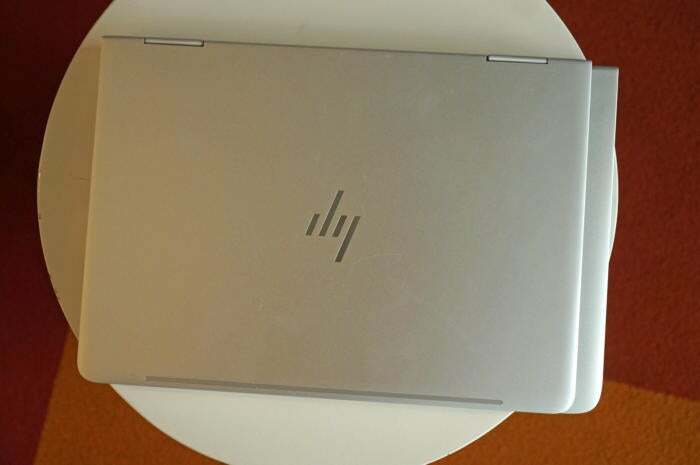 This time around, HP nearly eliminates the screen’s side bezel, cutting the width down to 12 inches. Even better, the weight is reduced to 2 pounds, 13.2 ounces. You might think seven ounces isn’t much, but it’s quite noticeable. In fact, the Spectre x360 13 is so small and light now, it’s practically on par with the diminutive Dell XPS 13, which clocks in at 2 pounds, 11.3 ounces. 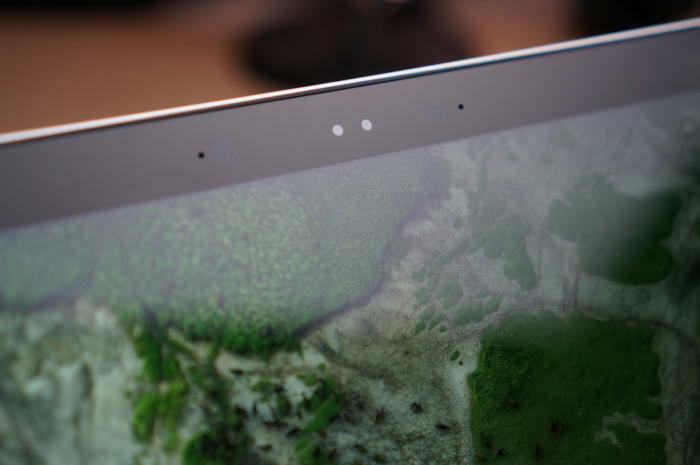 The Spectre x360’s extra couple ounces is likely due to its touchscreen, something the Dell XPS 13 in question lacks. The Spectre x360 is thinner than before too, at just about 13.5mm at its hind end. While we don’t think the pursuit of thinness is worth sacrificing all else (see Apple corporate policy), the proportions feel just right on the new HP. The new Spectre x360 gives up HDMI and DisplayPort for the newfangled Thunderbolt 3 USB-C ports. The original Spectre x360 was very generous with ports, offering full-size HDMI and DisplayPort plus three USB Type A ports. 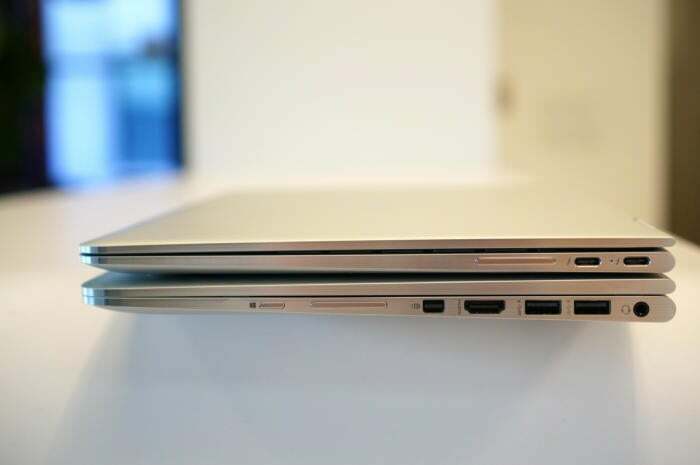 With the move to USB-C and Thunderbolt 3, the new Spectre x360 is far stingier. You get two Thunderbolt 3 ports that take over for HDMI and DisplayPort duties. They also double as USB-C ports with 10Gbps transfer rates. On the opposite side, you get a single USB Type A 5Gbps port. Gone from the Spectre x360 is the integrated SD card reader—but, hell, Apple even left that off its “pro” laptops, so why shouldn’t everyone else? You can see just how much HP chopped off the original’s size. Despite the screen being the same size, it’s down almost 7.5 ounces in weight. Inside the Spectre x360 you get top-of-the-line parts. Our $1,300 review sample includes Intel’s newest 7th-generation Core i7-7500U. It’s roughly 10 to 15 percent faster, depending on workload, than its predecessor and includes Intel HD620 integrated graphics with an updated video engine, which destroys older chips playing video with 10-bit color depth. It’s a good chip and you can read more about it in my review of the Kaby Lake laptop chips. The CPU is paired with 16GB of LPDDR3/1866 in dual-channel mode and a Samsung 512GB PM951 NVME M.2 drive. A spot-check with Crystal Disk Mark 5.02 put the drive’s performance at 1.7GBps read and 581MB/s write for sequential loads. Not bad, but not class-leading. The bezel is almost gone on the sides, but the top leaves room for an infrared camera that works with Windows Hello. The screen on our review sample is a 1920x1080 IPS panel with 10-point touch. Its backlighting is fairly even, and I measured its maximum brightness at about 350 nits. HP says the initial version of the updated Spectre x360 won’t support pen input. It’s not just a matter of a pen not being included either—HP decided against adding a digititizer for any pen support in this model. Future versions of the laptop with different screens may have pen support, however. As a consolation prize, you get an integrated IR camera that supports Windows Hello facial recognition. If you haven’t used a laptop with Windows Hello, you should. It’s a far better experience than biometric fingerprint readers. We also like that the web camera, in addition to the Windows Hello camera, is placed at the top of the bezel rather than down in a corner where it could get continually fingered—*cough* XPS 13. 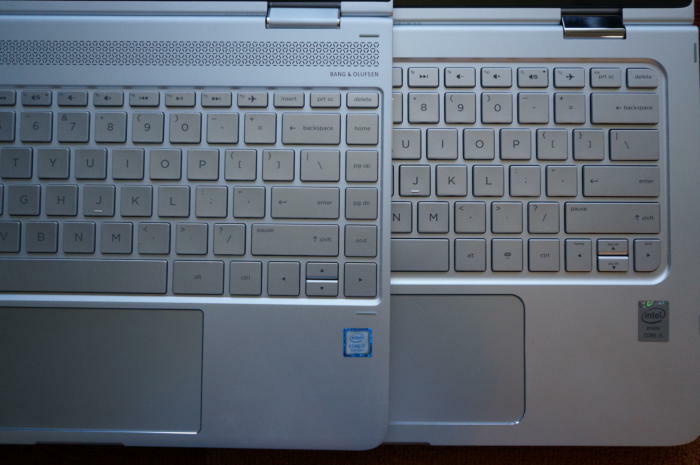 Like the original Spectre x360 13 (right), the new x360 (left) has an excellent keyboard. The original keyboard was always excellent and I have no complaints here either. 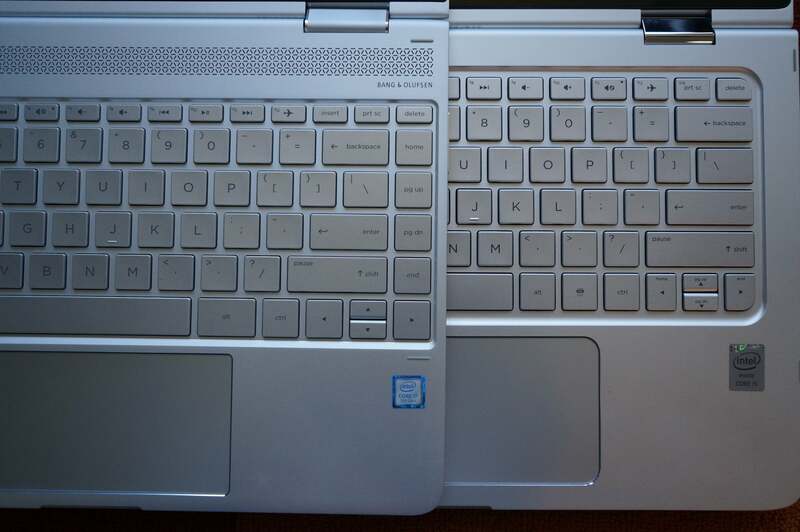 The wide-aspect-ratio piano-hinge-style trackpad is by Synaptics and also pretty good. It’s very smooth (which I prefer) and I didn’t have many problems with palm rejection once I became accustomed to the wider format. I should note that I couldn’t find anywhere to tune the palm rejection in the Synaptics driver, but maybe that’s just me. The speakers in the original Spectre x360 13 were excellent and continue to be in the update. Up against Dell’s XPS 13, I’d give the Spectre x360 a slight edge in audio for having a little more presence. For ultrabooks, both are still quite good, provided you expect small laptop sound from a small laptop. This review wouldn’t be complete without touching on USB-C charging. Laptops, if you don’t know, are slowly moving away from proprietary chargers to “universal” USB-C chargers. While Dell supports both USB-C and the typical barrel charger, its laptops continue to ship with the latter. HP finally dumps the barrel charger and ships a small 45-watt USB-C charger. The Spectre x360 will warn you if you use a non-HP charger and then it charges anyway. The problem with HP has been its conservative approach to USB-C charging, which you can read about here. 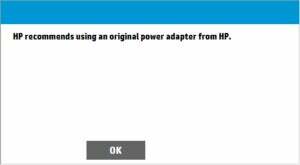 HP still says it only trusts its own chargers not to blow up its laptops, but it no longer shuts out third-party chargers like it did in the past. In my tests, the Spectre x360 kinda supported both a Dell USB-C charger and an Innergie USB-C charger. I say kinda because plugging in a non-HP charger pops up a warning, but the laptop charged anyway. What would be cool in the future—especially with these smarter chargers—is to provide information on the charge rate and what voltage rail it’s pulling from for a particular power brick. Too nerdy? For most users, probably, but as we sort out the mess of “universal” USB-C charging over the next two years, it would help isolate the problems. As much as people say performance doesn’t matter anymore, it does. If it didn’t, you woulnd’t be paying $1,300 for a laptop, you’d be paying $300. So let’s find out how the new Spectre x360 does. First up is PCMark 8 Work Conventional. This synthetic test simulates how “all work and no play makes Jack a dull boy” with office document chores, browsing, and video conferencing. With modern hardware, even ultra-tiny laptops, there’s not much of a difference among competitors in these tests, as the neck-and-neck results indicate. There are still some good signs for the Spectre x360 though. Its Core i7 Kaby Lake chip hangs right in line with a quad-core Skylake chip in this office drone test. And yes, that 1,717 score for the Surface 3 and its Atom X7 is right about where a system starts to feel less responsive. In office tasks, there is little variance among most laptops. Performance muscle might not matter much for office drone tasks, but it matters in other areas. 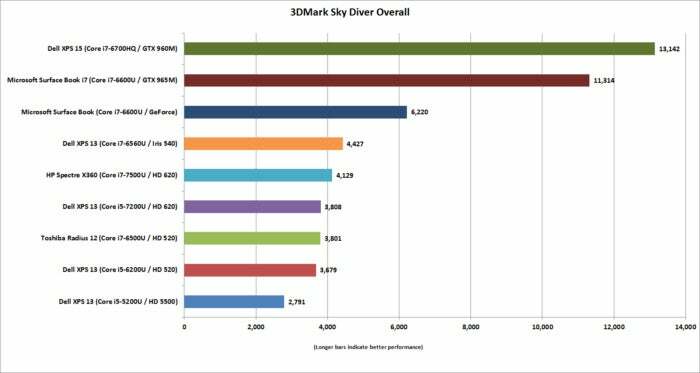 To measure it, we run Futuremark’s 3DMark Sky Diver test, which isolates the GPU. 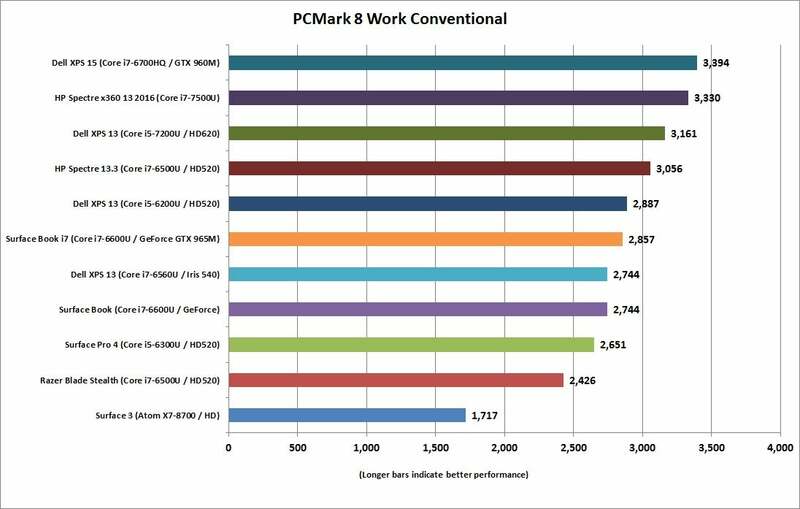 You can see from our chart that laptops with discrete graphics all rule here, but the Spectre x360 represents well. Among the integrated-graphics laptops, it’s the second fastest behind the Dell XPS 13 with fancy Iris 540 graphics. Will you be playing Rise of the Tomb Raider at 1920x1080 and Very High settings? No. But Minecraft, League of Legends, and other less taxing games at lower resolutions and lower image-quality settings should be tolerable. No other 13-inch Ultrabook can touch the Surface Book i7. But is it still an Ultrabook? While most people with ultraportable laptops don’t encode video for a living, we like to run this heavy-duty task to see how a laptop performs under a worst-case-scenario load. To do that, we turn to the free and popular Handbrake program, which we use to encode a 30GB MKV file using the Android Tablet preset. That can take two hours or more on a typical dual-core laptop. For context, I include a quad-core Dell XPS 15 and an Atom X7-powered Surface 3 tablet. A shorter bar is better performance and the quad-core wins hands down. You may be surprised to see the Dell XPS 13 with its 7th-gen Kaby Lake chip as the first dual-core laptop to cross the finish line but I’m not. Dell tends to run the fans faster if the laptop gets hotter, while other PC makers favor keeping the noise low and slowing performance accordingly. As this test takes two hours or more to run on a dual-core laptop, the performance advantage of the Core i7 in shorter burst workloads usually doesn’t matter as much either. As for the HP Spectre x360, it’s not bad when you consider that it’s thinner than the XPS 13 and is a convertible form factor. Convertible laptops, like hybrid tablet-laptops, typically give up some performance because they can be held like a tablet and PC makers don’t want them to get too scorching hot. 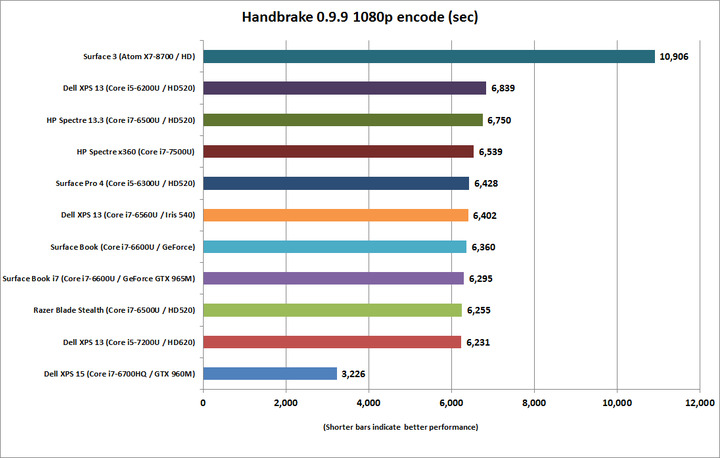 A dual-core CPU is pretty much a dual-core CPU on our lengthy Handbrake encode test. 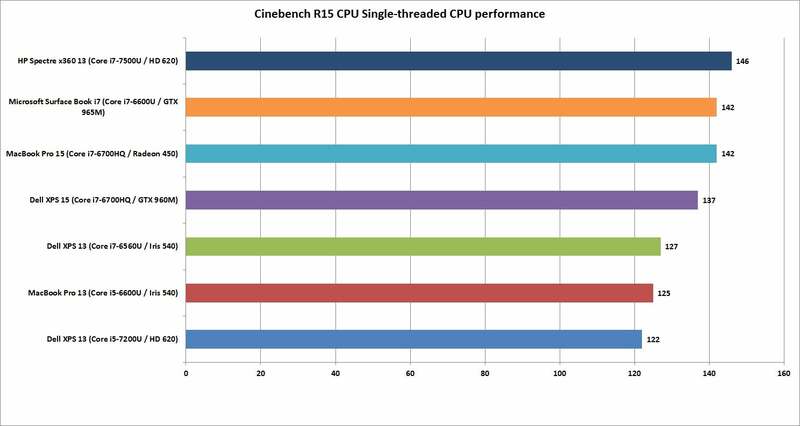 One last performance test worth nothing is Cinebench R15, set to test just a single CPU thread. It gives you an idea of how well a laptop will do in workloads that don’t tax all of the CPU cores. This is valid because the vast majority of tasks we do on the PC don’t actually push it that hard. The winner? 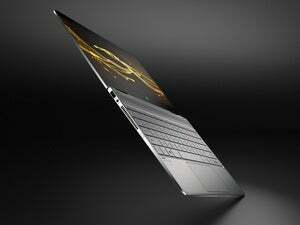 The HP Spectre x360 with its 7th-gen Core i7 chip. That score is slightly better than the larger and heavier Dell XPS 15 as well as Apple’s new MacBook Pro 15. It’s also faster than the exorbitantly priced Microsoft Surface Book i7. The pair of MacBook Pro’s were run with OSX Sierra, not Windows 10, in the interest of full disclosure. Under loads that don’t stress all of the CPU cores, the Spectre x360 surprisingly leads the pack. 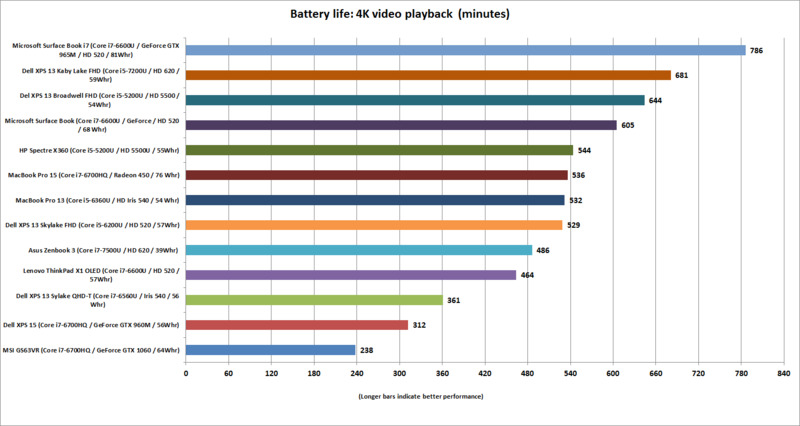 Our last test is perhaps the most important in an ultraportable laptop: battery life. For that, we loop the open-source 4K-resolution movie Tears of Steel with the screen brightness set to 250 to 260 nits. That’s a setting that would be used in a typical office in the daytime. All of the laptops have wireless turned off and audio is on but we use earbuds to minimize the sound system’s drain on the battery. For Windows 10, we use Microsoft’s Movies & TV player and on OSX Sierra we used QuickTime. A lot of different factors come into play for battery life such as the efficiency of the display, the resolution of the screen, whether there is a touchscreen digitizer, and the battery’s size. Driver hardware optimizations by each vendor can also come into play somewhat. If we look at the results for just the Spectre x360, it’s pretty damned good. It’s not as good as the newest Dell XPS 13, but the Spectre x360 has a touchscreen. The most impressive score is the Microsoft Surface Book i7 with its high-res panel, pen support, and touch. But it also has a giant battery and weighs quite a bit more too. Battery life on the MacBook Pro 13 and MacBook Pro 15 is respectable when you consider their high-resolution panels, and the quad-core in the MBP15. However, the Dell, HP, and Microsoft Surface Book i7 are the winners. Performance and battery life are excellent and the form factor makes it truly competitive with its arch-nemesis, Dell’s XPS 13. If we had to pick two things to complain about, the first would be the wide-aspect-ratio trackpad. Again, I think I could get used to it, but that large trackpad increases the chances of phantom palm taps. The other niggle is the ports. Yes, USB-C is great and wonderful and all, but the previous Spectre x360 had six ports that allowed to you charge with three USB devices plugged in, plus two monitors. With the updated Spectre x360, once you have a charger plugged in, you really only have two ports left. If one of those is connected to a monitor, you have one left. To be fair to HP, fewer ports are really the future, but that doesn’t mean we have to be happy with it. Still, it’s hard to argue with the new Spectre x360. It’s clearly the convertible to be beat today and possibly the laptop to beat as well.